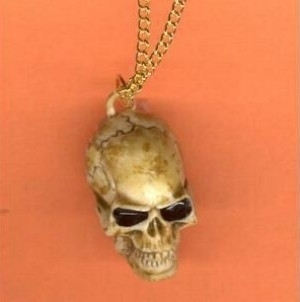 Realistic SKULL PENDANT NECKLACE - Gothic Wizard Witch Doctor Jewelry - Vintage Rubbery Plastic Antiqued Skeleton Head. Great for Halloween Punk Biker Costume, Pirates of the Caribbean Lover and Pirate Collector. Detailed Headhunter Voo-Doo Charm, approx. 1-inch tall x 3/4-inch wide, on 18-inch Neck Chain with safety clasp.